Macrocyclic lactones are a group of complex compounds with high parasiticidal efficacy that are either natural products produced by various soil microorganisms of the genus Streptomyces, or chemically modified derivatives of such natural products. They are obtained in fermentation processes using Streptomyces and subsequent purification and/or chemical modification of the fermentation products. According to their chemical structure there are two different groups: avermectins and milbemycins. They are also called endectocides because they show high efficacy against a broad spectrum of both endoparasites (e.g. gastrointestinal roundworms = nematodes) and ectoparasites (e.g. mites, lice, several insect larvae, etc.). 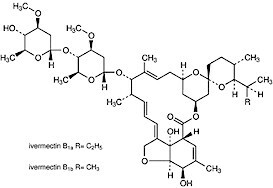 Ivermectin, the first macrocyclic lactone introduced for Animal Health in 1981 revolutionized the control of veterinary parasites in livestock, horses and pets. It was a huge progress for the control of many parasites. Today it is undoubtedly the active ingredient most used on livestock worldwide, with thousands of generic brands. All macrocyclic lactones have a systemic mode of action, i.e. after injection, ingestion or topical administration they get into the blood stream of the host, from where they are transported "everywhere" in its organism to kill the parasites. Topically applied endectocides can also act on the external parasites by contact. Interestingly, whereas most veterinary antiparasitics are spin-offs of agricultural pesticides or human medicines, macrocyclic lactones were first introduced for veterinary use and only later for agriculture and for human medicine. Abamectin: used moderately in livestock and scarcely in pets. Eprinomectin: used moderately in livestock and very scarcely in cats. Ivermectin: use massively in livestock, horses, and pets. Selamectin: used moderately only in pets. Milbemycin oxime: used moderately only in pets. Moxidectin: used moderately in livestock & horses, scarcely in pets. All macrocyclic lactones are effective against roundworms (gastrointestinal, pulmonary and others) but neither against flukes (trematodes), nor against tapeworms ( = cestodes). The spectrum of activity against external parasites varies. E.g. only selamectin is effective against dog and cat fleas at the therapeutic dose. Besides differences in their spectrum of efficacy, significant differences exist also regarding their pharmacokinetic behavior in the host's organism. E.g. whereas most livestock endectocides produce more or less residues on milk, eprinomectin does not and was the first endectocide allowed for dairy cows. However, in the meantime doramectin and moxidectin have also been approved for use in dairy animals in some countries. Ivermectin is also used as a human medicine. Ivermectin and abamectin are also used in agriculture. The other ones are exclusively used on animals. All macrocyclic lactones have already lost patent protection. Manufacturers of generic active ingredients (typically in China, India, Israel, Brazil, etc.) already sell most of these compounds. However, whereas there are thousands of commercial brands with generic ivermectin, there are still only few brands with other generic endectocides. Macrocyclic lactones are available in many different formulations. For livestock there are injectables, drenches, pour-ons, slow-release boluses, feed additives. They often contain mixtures of macrocyclic lactones with other parasiticides to complete the spectrum of activity (e.g. with a flukicide). For cats and dogs, macrocyclic lactones are available mainly as tablets, pills or drenches for oral administration. Injectable macrocyclic lactones for pets are rather scarce. There are specific oral paste or gel formulations for horses, mainly with ivermectin and moxidectin. The reason why injectables are not used on horses is that 30 years ago, when ivermectin was introduced, horses developed severe clostridial infections at the injection site (due to contamination of the needles) and other undesirable side-affects much more frequently than cattle, sheep or pigs. In addition, the pharmacokinetic behavior of ivermectin on horses is different than in ruminants or pigs. As a consequence, specific oral pastes or gels that do not show such side effects were developed for horses. Macrocyclic lactones act as agonists of the GABA (gamma-aminobutyric acid) neurotransmitter in nerve cells and also bind to glutamate-gated chloride channels in nerve and muscle cells of invertebrates. In both cases it blocks the transmission of neuronal signals of the parasites, which are either paralyzed and expelled out of the body, or they starve. They also affect the reproduction of some parasites by diminishing oviposition or inducing an abnormal oogenesis. Macrocyclic lactones have a very high inherent efficacy against many parasites, i.e., they kill them at very low concentrations. E.g. whereas an organophosphate may kill blowfly maggots at concentrations of a few ppm (parts per million) in the rearing medium, macrocyclic lactones do it at concentrations of a few ppb (parts per billion). This means that they are up to thousand-fold more active than other parasiticides. This makes it possible to use them at very low concentrations, which significantly reduces the safety risks for both the treated animals and the operators. Besides their high efficacy, macrocyclic lactones allow protection periods after a single treatment (several weeks up to a few months, depending on parasite and formulation) substantially longer than those of most other anthelmintics (usually only a few days). The reason is that, in most cases, after administration they are temporarily stored in the body fat and are released back to the blood progressively during several weeks. Once administered to the treated animal, either orally, topically or by injection, macrocyclic lactones quickly reach the blood stream and are distributed throughout the body. This allows them to reach the parasites almost everywhere: in the digestive system, in the lungs, in muscles, in the kidneys, in the eyes, etc., even if they are not bloodsuckers. The largest part of the active ingredient administered is usually excreted through the feces and the amount metabolized is usually rather small. But depending on each compound, the distribution in different organs and the time to excretion can be different. Whereas most macrocyclic lactones for livestock leave substantial amounts of residues in milk (up to 5% of the administered amount) and are not allowed for dairy animals, other macrocyclic lactones produce less (e.g. 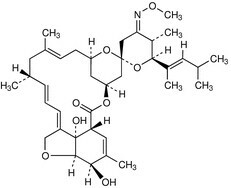 moxidectin, doramectin) or almost no residues (e.g. eprinomectin) in milk and are now allowed for use on dairy cows. Most endectocides for use on livestock offer a safety margin of 10 or higher, i.e. they can be administered at up to 10 times the recommended therapeutic dose without risks of serious side effects. As a general rule, correctly used macrocyclic lactones are well tolerated by livestock, horses, dogs and cats. The reason why they are not as toxic to mammals as to parasites is that the nerve cells of mammals do not use the glutamate-gated chloride channels, and the GABA neurotransmitters occur only in the mammalian brain, which is protected by the blood-brain barrier that does not allow macrocyclic lactones to get into the brain. Withholding periods between treatment and slaughter of livestock vary between ~2 weeks for eprinomectin and 5 to 6 weeks for most other endectocides at the usual dose rate (mostly 200 to 300 mcg/kg). At higher rates such as those of long acting formulations (e.g. injectables with 3.15% ivermectin, slow-release bolus, etc.) withholding periods may be 12 weeks and beyond. However withholding periods may significantly vary from country to country. Since most of the amount administered to livestock is excreted unchanged in the feces, there is a risk that dung fauna is exposed to toxic concentrations. A lot of investigations have been carried out on this topic worldwide and it has been confirmed that this can actually happen, especially in dung of range cattle. However, expert opinions differ on its practical relevance and its long-term effect on the environment. The fact is that more than 30 years after the introduction of ivermectin and after at least 10 years of massive use worldwide after patent expiry, there are no confirmed reports on serious environmental damage. And there are no reports on pastures with a problem of un-recycled dung due to the use of macrocyclic lactones. Second reason. Most products with macrocyclic lactones are effective against heartworm larvae in the blood. Heartworm infection (Dirofilaria spp) is a common disease in dogs in regions with hot or mild weather. The disease is called dirofilariasis. It is transmitted by mosquitoes. It is less frequent in cold regions but can occur there as well. Cats can be affected too. Heartworm preventatives hinder heartworm larvae (microfilariae) in the pet's blood to complete development to adult worms. But such products can also kill some adult worms, if not all, dependingon the daministered dose. Now, dead adult worms or their rests "swimming" in the heart or in the pulmonary artery can obstruct the pulmonary blood vessels with the consequent damage to the lungs, which can be fatal for the pet. This means that any dog that is treated with a macrocyclic lactone should be checked for already existing heartworm infection. If the check is positive, the heartworm infection has to be treated with other specific heartworm products under strict supervision of a veterinary doctor. Where heartworm is very common (i.e. in endemic regions) testing cats for heartworm may also be indicated before administering a macrocyclic lactone. Livestock products not explicitly approved for pets should never be used in cats and dogs !!! Without reliable use instructions they can be easily overdosed, and they may contain ingredients that are toxic for pets. Use of macrocyclic lactones on livestock, horses or pets bears no serious safety risks for farm workers, pet owners or children playing with the pets. Nevertheless, after topical application (e.g. pour-on, spot-on) it is better to avoid contact with treated animals during the first hours or days. Never use livestock, horse or poultry products on dogs and/or cats,, unless explicitly approved for dogs and/or cats too. Without reliable use instructions they can be easily overdosed, and pets may not tolerate formulations developed for use on livestock, horses and/or poultry. Some active ingredients may be toxic to particular animals. Unfortunately, resistance of several parasites to ivermectin and other macrocyclic lactones has spread throughout the whole world, especially among gastrointestinal roundworms of sheep and goat, and to a lesser extent of cattle. The most affected worm are those of the genus Cooperia, Haemonchus, Nematodirus, Oesophagostomum, Ostertagia - Teladorsagia and Trichostrongylus. All macrocyclic lactones show cross-resistance, i.e., parasites resistant to one macrocyclic lactone will sooner or later show resistance to the others as well, although different compounds can show different resistance factors. Several gastrointestinal roundworms of horses have also developed resistance to macrocyclic lactones, mainly Cyathostomins (Small Strongyles) and Parascaris equorum. Resistance of external parasites to macrocyclic lactones is still infrequent, probably due to the fact that they have been used in ruminants much more against gastrointestinal nematodes than against external parasites such as ticks and flies. Today there are a few reports on field resistance of cattle ticks (Boophilus = Rhipicephalus microplus) in Brazil and Mexico with rather low resistance factors (<10). However, in view of the current massive use of macrocyclic lactones against external parasites on ruminants in numerous countries it is most likely that resistance of cattle ticks will spread and strengthen, and that appearance or resistance in horn flies is only a matter time. So far there are no reports on practical resistance problems to macrocyclic lactones with parasites of pigs. In dogs resistance of heartworm microfilariae to ivermectin has been confirmed in the USA (so far mainly in the South), with cross-resistance to all other macrocyclic lactones (milbemycin oxime, moxidectin, selamectin).